So, let me give you some preemptive information. When I downsized a while ago, I thought I lost something which is important to me. It is something very strange, and one of a kind, and probably weird. Still, I think that by this post, number 101, you have already come to understand that I do not ever want to be a sheep (not an ordinary sheep anyway) and I guess the those who look at and read my blog also desire the unusual. When I was a kid there was this thingamajig at the house of my grandma Violet Augusta Compton (Rickards) and my grandpa Robert Charles Rickards. I would pick up the jar it was in and look at it for hours when I was a little girl. I don’t know… I guess I thought it fascinating, you know, I still do. I need to go back even farther… My great grandmother Violet Augusta Henderson (Compton) and my great grandfather Frances Gilbert Compton were living on the Carey-on Farm, on what is now the Rudledge Road, leading to Sydenham in Ontario. The great depression was on when they moved there. Times had been very hard… they had lost a lot. This was their fourth home during those years. They could not keep up the payments and had been forced to move on, and move on, and move on. They had nothing but kids to feed a couple of black faced sheep. Sadly one of the sheep miscarried a malformed babe just after they arrived there. The baby was stillborn with two and a half feet on every leg. A sort of siamese triplet. For some reason, my great grandfather who we all called Dad, took the foot off that poor lost babe to show it to others because he had never seen anything like it. At this time in history, I guess, you would look it up on the internet, but then, word of mouth and show-&-tell was about all they had. Anyway, the depression began to grind to a halt, and things got a lot better for Dad and Ma and their family. 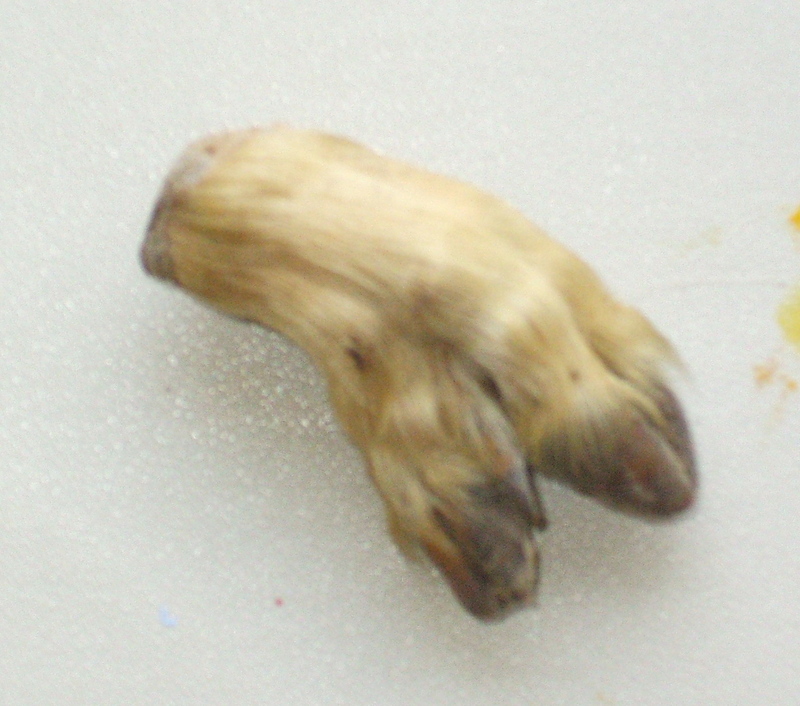 But that unusual sheep’s foot was there and somehow it became sort of synonymous for changing luck – like a rabbit’s foot… not so lucky for the rabbit – but you understand, just one of those funny talismans. Personal to us. Anyway, my grandma gave me the foot many years back. I had a rough time as a single mom and I guess she thought I could use the upswing… and now you know why I was so sad to lose it, happy to find it and now I will share it with you. Here is the tiny footlet. It is just an inch and a half long and from spring of 1937 (if I remember correctly); it is 75 years old.